The nose was complex and interesting – sweet and spicy with some cosmetics and light struck match, plus an array of outdoor impressions (earthy, grassy, ripe fruits, wood sap, twigs and riverbanks). It seemed fresher with water (peach melba yoghurt, leaf mould, washing blowing in the breeze) though one panellist got a rugby player’s kit-bag. The palate however had massive, intense sweetness and mouth-scorching peppery, ginger heat – panellists reported Vimto concentrate and rhubarb dipped in brown sugar. With water, we found toffee, butterscotch, Old English spangles and ice-cream soda, with a few more masculine hints of mint tic-tacs, old wood and allotments. Drinking tip: Benefits from water and the attraction is mostly in the taste – a drinker’s, rather than a sniffer’s, dram. Short, sweet and zesty but in a rather different way than most of the young (NAS?) and relatively characterless stuff that may have been being released by certain official bottlers from other distilleries. This Royal Brackla expression does appear to fir the same flavour profile we experienced in the much older McKillop’s Choice expression giving us some sense of distillery character. I am interested to see how the recent official expressions from Dewar’s compare to these exemplars? 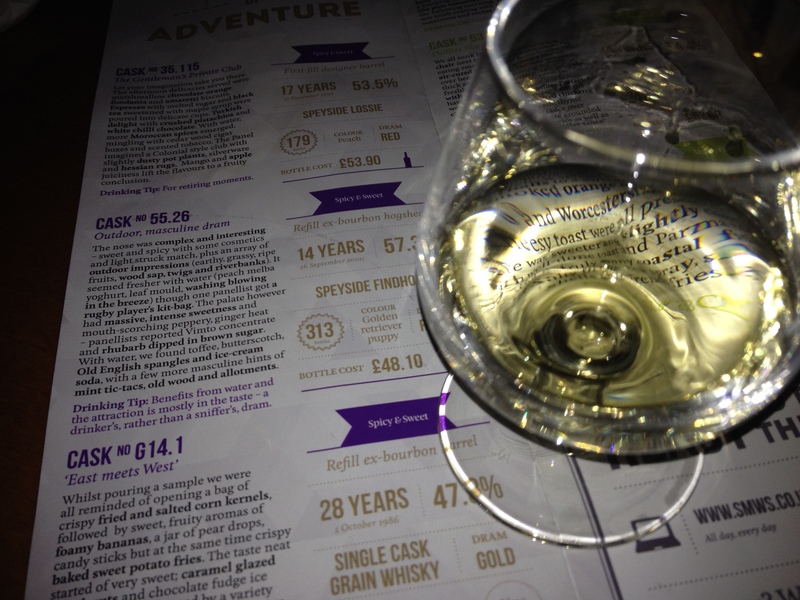 Once again a great dram from SMWS capturing both individual cask character and also nature of the underlying spirit.